Our Agile Quarterback Service is like coaching but on steroids! Leveraging from the Jira Software Agile platform, Blended Perspectives is pleased to announce its new Agile Quarterback Service. This latest consulting offering will enable clients to understand how all teams are performing in an enterprise and how to best utilize them. This flexible solution can be configured so that it provides continuous assessment or alternatively simply a one time review. Blended Perspectives can provide experienced Scum Masters with a unique blend of Jira and analytical skills. In addition to providing a wide array of Agile expertise to improve the overall performance of client teams. With our coaching methods, you could take your teams up to the next level! A common problem in Enterprise Transformations is that Agile often means something different to everyone involved. Without a clear understanding of the goal, it is hard to set direction, measure progress, or achieve success. 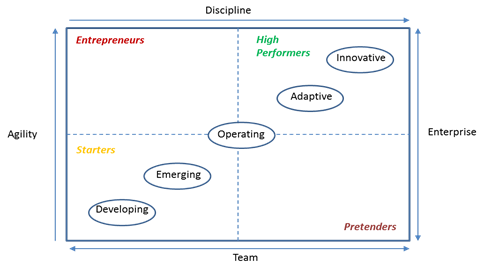 That is where our self produced Blended Perspectives Agile Enterprise Maturity Matrix comes in. It is the ideal tool to understand where opportunities exist to improve performance. CIOs can also use it to increase investment to create truly world class Agile practices. If you wish to find out more about our Agile Quarterback Service to transform your organization then contact us now.